The CHP says a woman apparently trying to avoid a law enforcement officer was injured after a car went sailing off of a road in the Gaviota area, and plunged down an embankment to the edge of the main coastal rail line. A state park ranger noticed a vehicle stopped near Calle Real and Refugio Road Thursday afternoon. When the ranger stopped to talk to the female driver, she sped away from the scene. Moments later, the car plunged off the road and hit a utility pole, before ending up just yards from the rail line. It shut down rail traffic for hours. A project to realign a potentially dangerous section of Highway 101 on the Central Coast is set to begin. The project will straighten a curve on northbound 101in the Gaviota area. The work zone extends from Mariposa Reina to the Gaviota rest stop. The construction will take start Monday, and is expected to take about five months. There could be delays of up to ten minutes, and concrete barriers being set up to protect construction crews will also mean a narrowing of lanes in the area. 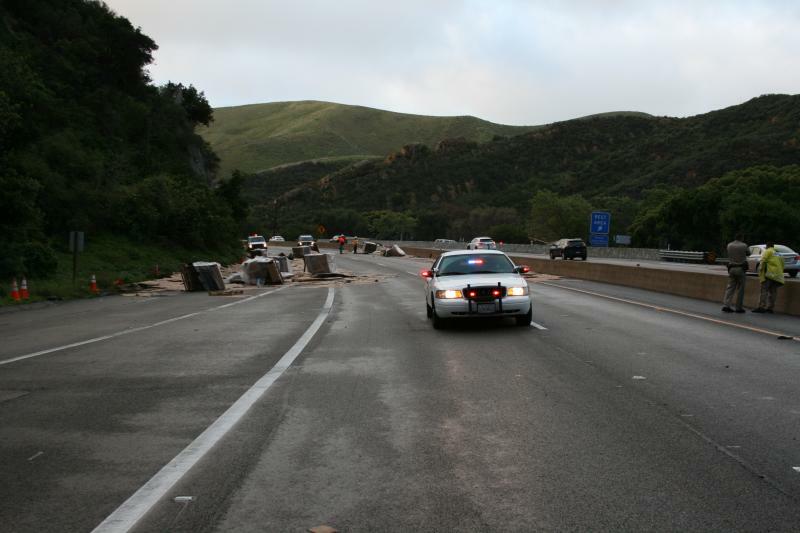 Traffic is once again flowing normally on Highway 101 in Central Santa Barbara County, but that definitely wasn’t the case this morning. A series of traffic accidents involving a half dozen vehicles closed down the northbound 101 near the Gaviota Rest Stop for nearly three hours.